I spent last Sunday building the new machine with Cian. He helped drop the CPU into its socket, as well as one of the RAM DIMMs. He enjoyed that bit. I think he also enjoyed blowing the awesome amount of dust out of the existing case to make it ready for reuse. Anyway, so it is all built, and it is bloody fast. There was a noticeable increase in speed after adjusting the BIOS to use the RAM's XMP (extreme memory profile) which auto sets the BIOS parameters to make the most of your RAM, if it supports XMP. Since I have 1333Mhz DDR3 RAM in triple channel mode and CAS latency 7, it made a good difference. 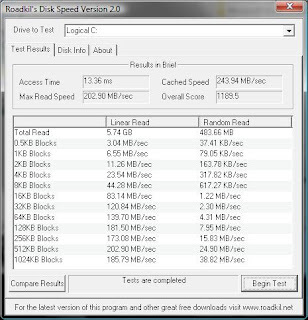 I've installed 64 bit Vista, and am now using the twin TB drives in RAID 0 configuration, check the diskspeed output! I had a minor scare this morning after I ripped out the old drives after copying everything to the new drives. The thing didn't boot into the BIOS, and wouldn't respond, so I had to use the PSU switch. That killed all the BIOS settings when it returned, thankfully, next boot. Scary. Oh, yeh, I ran the Crysis demo yesterday. Ran it at 1200x800 or so, 4x AA. Sweeet. Still waiting for another quiet case fan to arrive. I need to use three case fans to keep the temperature down, and the old case fans are really noisy. Got me some of these. Next is to move the guts from my old PC to the server, to update it a bit as well.